Do you like Zomzom.io? Share it with your friends. 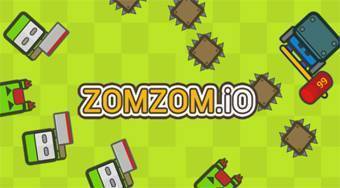 Zomzom.io is another multiplayer game from the popular .io games series. In this game, move your character around the playing area to collect fruit, wood and stones. From the wood and the stones, build the defenses of your territory. Use different weapons to kill the bloodthirsty zombies and the characters of other players from around the world.